Welcome to the Web site of Diane Diekman, a South Dakota farm girl who became a U.S. Navy captain and a writer of biographies.If you are a Faron Young fan – you will want to check out the links to read more about my book: Live Fast, Love Hard: The Faron Young Story. A profile of Faron, along with several of my articles about him and his band, can be found in the “Faron Young” section. 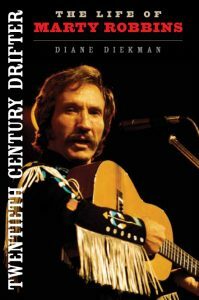 I’m proud to announce that Twentieth Century Drifter: The Life of Marty Robbins won the “2013 Best Book on Country Music Award” from Belmont University and the Mike Curb College of Entertainment and Music Business. The Marty Robbins page on this site contains ordering information and my answers to questions about researching his life. 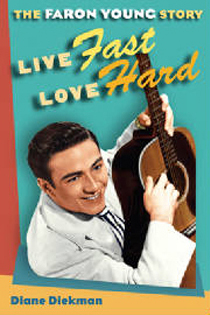 Live Fast, Love Hard: The Faron Young Story and Twentieth Century Drifter: The Life of Marty Robbins are both available in paperback as well as hardcover, and they can be downloaded as e-books. From the time I was a first grader, and won the prize for reading more books than anyone else in our one-room country school, I’ve loved reading. Check “Books I Like” to see if some of my favorites are your favorites, too. As well as information on my two memoirs, Navy Greenshirt and A Farm in the Hidewood (both are available as e-books), this site contains a variety of articles about Navy life and some of the places I’ve visited around the world. I’ve included several speeches and eulogies, too. Send your questions and comments to diane@dianediekman.com. I’d love to hear from you.